Save Money, Save Gas Feathering the PedalEliminate The Muda! There are many ways to save money on your automotive expenses. Commonly used tips in articles and by bloggers include: Ensuring your tire pressure is correct, keeping up with routine maintenance like replacing your air filter and only buying regular gas. Few of these tips have as much impact on your mileage as how you actually drive your car. Some of us, me included, are alchemists behind the wheel, turning your foot from flesh to lead. 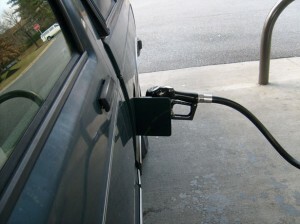 A heavy foot simply wastes fuel, pushing more gas into an engine than necessary. In the days before navigation units and fancy electronics I once worked as a service advisor at a car dealership. One of the most difficult questions faced were customers inquiring why their car was not getting the same mileage as advertized. I won’t go into all the lame excuses we gave, but I will share how I finally learned the single biggest factor in your true gas mileage. Your foot, that’s it, the single biggest factor. Want proof? Rent or borrow a hybrid that has the fuel efficiency screen. Toyota is one brand that has these screens. There are also units, like ScanGuageII available that you can connect to your vehicle that will show your exact mileage rate at any moment. The variation in gas mileage and how much control you have over it is astounding. You can increase your mileage significantly by accelerating slowly. When you stomp on the gas pedal, the engine is flooded with as much fuel as it could take. Your mileage rating will fall into single digits. When you only gave it as much gas as necessary to continue accelerating at a mild rate, you can consistently get better mileage. This is called “feathering the pedal”. I tested this approach recently in a Lexus 2007 RX400h I had the pleasure of driving for several weeks. According to the U.S. Government Fuel Economy charts this vehicle is rated at 26 miles to the gallon combined city and highway. I used a routinely traveled 18 mile route consisting of mostly highway driving. My average mileage with my routine driving style was only 19 miles to the gallon. Over the course of three round trips I consistently, accelerated lightly from every stop light. With highway on-ramps I applied just enough pedal to continue increasing speed at a reasonable rate, and avoiding my typical left lane warp speed approach towards commuting. The result… My mileage was up to 23 miles to the gallon. That’s a 20% increase or looking at it from with a Muda perspective that’s a 20% savings. To learn more about saving money behind the wheel and getting the most out of every mile, take a look at this cool site on Hypermiling. Save money on maintenance, learn how here. Just starting to take a look @ your site! Like it so far. Saving money is something I am great at. Investing, not so much. Your fuel economy post reminded me of a great piece Top Gear did where they put the Toyota Prius against the BMW M3. “Spot on” as I think they might say in England! That was an excellent clip. I’ve since had some more fun experimenting with my driving habits, (although forced due to a speeding ticket!) it is amazing how much control your foot has over your mileage. Scary to think how much people are spending to buy more fuel efficient cars when they could save lots and have more impact by just driving smoother. Thank you for the link, it’s worth the look!